If you're an avid fisherman you no longer have to wait to get back to shore to enjoy your catch. 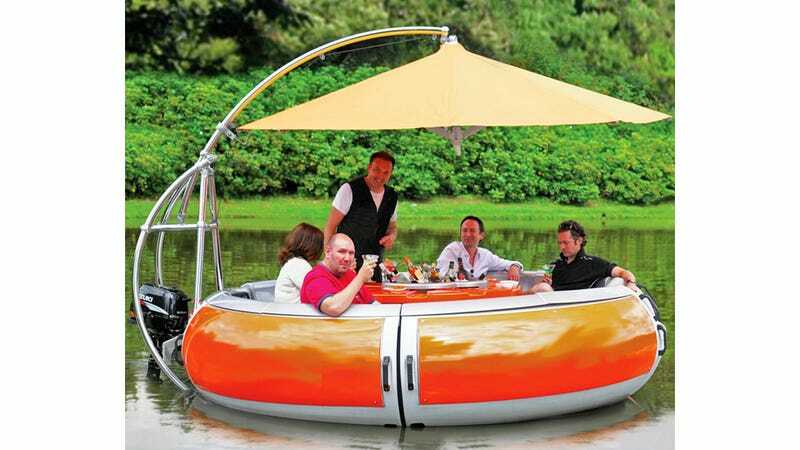 But it will require you to trade in your fishing boat for this $50,000 floating BBQ that can accomodate up to ten passengers. A 30-watt electric trolling motor lets you silently meander along the shore up to 2 1/2 mph without scaring off fish, and its four rechargeable batteries are good for an eight-hour cruise. But the star of the show is the vessel's 24-inch steel charcoal grill that's surrounded by ten place settings for all your guests. It allows you to entertain even when you're miles from shore, and thanks to a series of hidden compartments beneath the waterproof ABS seats, you'll never run out of food or beverages. It's even got a giant eleven-foot wide umbrella to protect everyone from the sun and rain, and it retracts when grilling so the whole thing doesn't become a giant smoke house asphyxiating everyone on board.